Karolina Miller is an editor for VC Studio. From video/audio downloading to DVD creating and converting, she knows them all. And she likes sharing her thought and solution about multimedia. Watermark is a recognizable image or text pattern that appears on your video. It can be found on the center of the video, or in one of the corners. Most of the time, watermark is transparent for keeping the completeness and beauty of video. It can be used for protection or adding introduction about the video source, date of creation, ownership, etc. to your video. With a customized watermark, you don't need to worry about the copyright and the unauthorized use anymore. Here are some simple ways you can add watermark easily. Video Converter Ultimate enables you to place text and image watermark to your video. It provides convenient and excellent solutions to finish the watermark by using the friendly and easy-to-use interface. The other main feature of this program is video conversion. It supports almost popular video formats and high conversion speed. If necessary, you can convert any video format to your desired format. With Video Converter Ultimate, you can easily add watermark to your video. It also provides other editing function for users. • Click the "Add Files" button to open the file explorer, then choose the right video. 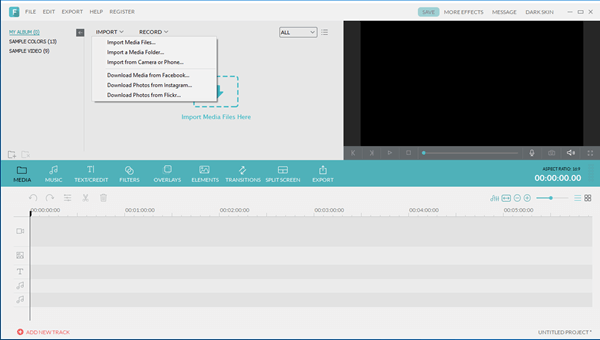 • Drag and drop the video file to the main interface. Find and click the "Edit" button from the right of the video information. It will open the editing window with some editing features: Trim, Adjust, Effect, Watermark and Subtitle. Go to "Watermark" selection, the watermark it supports can be either in textual format or imagery format. You can choose "Image Type" to add the picture from your computer. If you just want to add text watermark, tick the "Text Type" then input the text on the box. Besides, it also allows you to change the font and size of the text by clicking "T" icon. Finally, set the transparency of the watermark and click "Apply to all" button for applying the watermark to whole video. This program will specify a default storage file path to you. To find your video files easily, you can click the "Browse" to change the output folder. Select a video format you like then click the blue "Convert" icon to save your video with watermark. Video Editor is an overall and easy-to-use program which enables embedding all kinds of text watermark and any image watermark to video. Compared to the previous approach, it provides various effects to make your watermark more unique and attractive. As a professional Video Editor, it has other powerful features with many stunning effect. Video Editor can help you add various watermark to your video to personalize it. Download this program and have a try. Double click the icons to open the Video Editor, select the "Full Featured Mode". Click the "IMPORT" button to add the video files. The videos will be listed on the media library. Drag the video to the video track on timeline, then click "TEXT/CREDIT" to select a text effects you like. Click "+" icon to apply it. You may impose watermark on a whole video file or on a specified section of the video. You can drag the text on the timeline to adjust the displayed position on video and stretch the text to adjust the duration time of display. Now double click the text located on the timeline, it will open a pop-up editing window. Here you can change the font, font size, text effects, watermark size, watermark location and others. Find your image (such as your signature, company logo) in the media library and drag it to the picture timeline. First you can adjust the image size and location on the preview window. In a similar way, adjust the position and duration time by dragging and stretching the picture. Double click the picture you will find more amazing effects. Step 5. Save your Video File. Click the "EXPORT" button. Set the proper output settings then click "EXPORT" on the output window. You can choose one of the method to watermark your video to identify it according to your demand. With Video Converter Ultimate, you can easily add watermark with few steps. While Video Editor provides more text effects to make the watermark more amazing, but the operating steps will be more complex than that for Video Converter Ultimate.